Selling or buying an aircraft is a complex process. 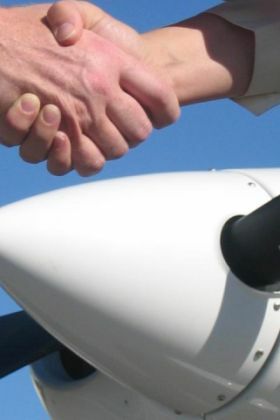 When looking for a new or an used aircraft for sale, we match it to your specific needs. Our transaction brokers can handle all the phases of a contract negotiation. Leave the worldwide market research and negotiations to us and be assured that you don’t miss valuable information and the best opportunities. important factors determine the selling price of a preowned aircraft for sale. every aircraft loses from its value for every hour it flies over the fleet’s average. That per hour reduction changes depending on the model and grows smaller as the aircraft ages. Though flying under the fleet average is good for other reasons, the market does not offer a similar advantage to aircraft values when the total number of hours flown is below the fleet’s average. Consequently, early in an aircraft’s lifecycle, total airframe hours have greater impact on an aircraft’s value. Years later, the age of the aircraft for sale affects resale value more. The closer an engine is to its recommended time between overhaul, the less its value. Equally important is a record of consistent use coupled with a good maintenance program. The technology inside the aircraft can have a noticeable impact on values, good and bad. Some owners double the value of their older models by installing new avionics. Conversely, dated technology, including old air conditioning and aging deicing gear can bring down resale value because those systems are generally more expensive to maintain. A damage history will decrease the value of an aircraft for sale. Buyers should consider the type of accident, nature of the damage, who repaired the damage and the degree to which the issue affected major components. Pre-purchase inspectors should closely scrutinize damage history to make sure it is properly repaired in accordance with applicable FAA regulations and recommended practices. New paint jobs can increase the value of an aircraft for sale, but buyers should be careful. The work could hide corrosion under the surface, which can negatively affect value. Interiors that are in good condition and properly fit also enhance the value of the aircraft. Even so, some owners still choose to update their aircraft’s interiors before they sell so that colors and patterns more closely match the latest trends. Choosing to do so can lessen the time the aircraft for sale are on the market.